While many see the week between Christmas and New Year’s as a time to gear for New Year’s Eve parties and rest up for the semester ahead, one group of ’07 alums travelled down to Managua, Nicaragua to spread a little Christmas joy and get some kids enrolled in school. 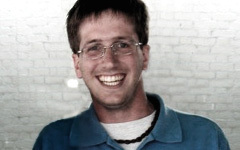 The trip was part of an organization named Visedal, which was started by Dylan Waugh ’07. Dylan spent about 6 months living in Managua after graduation and saw a need for a program that helped take kids off the streets and put them in school. A year later, there are 20 kids enrolled in the program that provides an education and ultimately end the cycle of poverty they are born into. Emily Vitrano and Nefret Hanna who graduated with Dylan and I also came on the trip along with Dylan’s parents and aunt. We got down there on a Saturday night, and by Sunday afternoon we were swamped by the 20+ kids that were so elated to see us. This was my fourth trip down to Managua and I really didn’t know what to expect. So often, people I talk with about my time in Nicaragua react with “oh that’s so great you’re doing so much good” or “wow those people must appreciate it, because they are so poor.” It’s easy to think. It’s easy to go down there with the attitude that I’m going down to do good and I’m the one doing the service. This couldn’t be further from what I’ve actually felt. Every time I go down to Managua, I am blown away by how much I get out of the trip. I’m not talking material goods or food or whatever. I’m talking about that intangible sensation someone starts to feel when they are among people who have less than they have. I’m talking about the feeling of envy that rises up when you see how happy and fulfilled life is in the midst of poverty and how much that contrasts with our feelings of material inadequacy and emptiness. I’m talking about real happiness. That special kind that comes from being surrounded by friends and family, from being a part of a community, from being forced to live day to day trusting that somehow everything will work out and you’ll get to eat dinner. Despite the poverty (Nica is the 2nd poorest nation in our hemisphere), there is a richness of life in Managua. I don’t think that it’s anything special that there were four of us on this trip that started out at William and Mary. If anything, I think it’s quite ordinary. I mean look at us. We’re a school that thrives on international experiences, service and giving our time to things other than our books. You got your George’s and Cosmo’s and Devon’s and Meghan’s and Dylan’s. It really is a contagious thing around here. I’m not sure of another school that has so many students starting so many different non-profits and international service experiences. Kinda cool. If there was one thing about Nicaragua this time around that I will never forget, it was the Gringo shrine in one of the kid’s houses. The family had put all the pictures we’ve shared with them, including some of us, on a cork board that hangs in the main room of their tiny, dirt-floored home. It took me a good solid 3 tries before I could really look at it without getting choked up. Besides the cool factor of the families cherishing these pictures, there was a much bigger message hanging on the wall. We were having an impact on these people’s lives and we were making a difference. It was clear that these families are engaged with the program. 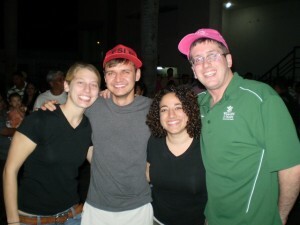 This picture is the four of us WM grads hanging out on the street in Managua where the Sandinistas were throwing a huge concert (hence the stylish FSLN hats Dylan and I have). We had a blast in Nicaragua, serving the kids and getting so much out of it ourselves. And still, it’s so weird for us to stop and think that our friendships all started six years ago on a hot and sweaty August move-in day in Williamsburg.